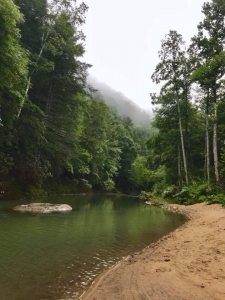 Home Recreation Rail Excursions Pedal-train excursion leads tourists into remote central W.Va.
Enthusiasts touring central West Virginia pedal the old Buffalo Creek & Gauley Railroad, now a rail-trail in Clay County. 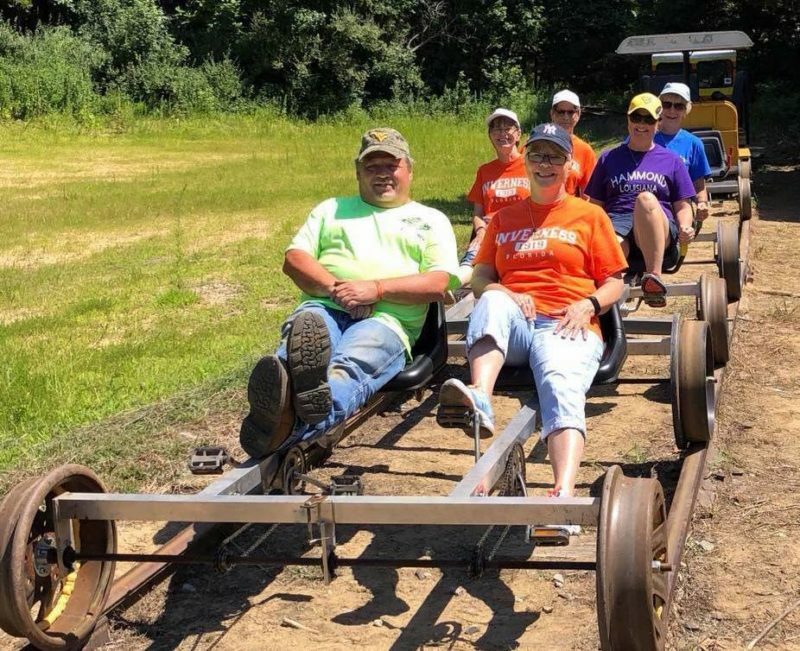 A new pedal-train excursion that leads tourists along a glittering trout stream and deep into the mountains of central West Virginia has attracted more than 1,200 guests from 20 states in the last 30 days, according to spokesmen for the venue. “Most of what we’re seeing so far is from word-of-mouth or from Facebook,” conductor Bruce Gill said of the excursions, journeys that take approximately 2.5 hours and may be made by four-seat pedal carts or towed by a small motorized speeder. Buffalo Creek descends out of the mountains of central West Virginia. Long isolated from the world at large, the line that follows the scenic vale of Buffalo Creek has been a focus for the attention of the Clay County Business Development Authority, which has secured access and is fostering development along the way. Authority president Mitch DeBoard said plans to extend the route nine miles are underway, though flooding in the valley and on the Elk River in 2016 severely damaged the route, along which repairs are being made. Not only is the project unique in West Virginia, the Buffalo Creek Recreational Trail is the second longest rails-with-trails project in the U.S., DeBoard said, emphasizing “with.” Only one other rail-trail project with rails is longer. Gill said riders so far have been fascinated by the scenic landscape and historic sites along the route, which was chartered in 1906. Highlights include the route include the remnants of a train wreck, 70-foot Devil’s Sawmill Falls, and the pre-railroad Adair Cemetery, dating from the 1800s. Railfans are particularly interested in cut-stone bridges and Pittsburgh-sourced ironwork. 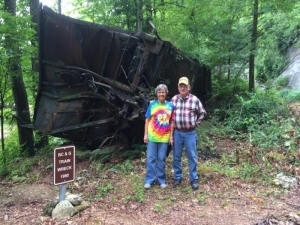 Sightseers stop at site of an old wreck. Five stops are scheduled along the way, though Gill and DeBoard said they’re happy to accommodate guests, including those who might like to wade into swimming holes on Buffalo Creek. Excursions are now conducted at 9 a.m., 1 p.m., and 5 p.m. Thursday through Monday and are $25 per adult and $15 per child 12 and younger. A Haunted Train Ride is planned for the fall, and until the excursion’s website is opened, prospective riders are encouraged to call 304-618-7992 or visit their website, Buffalo Creek Trail.